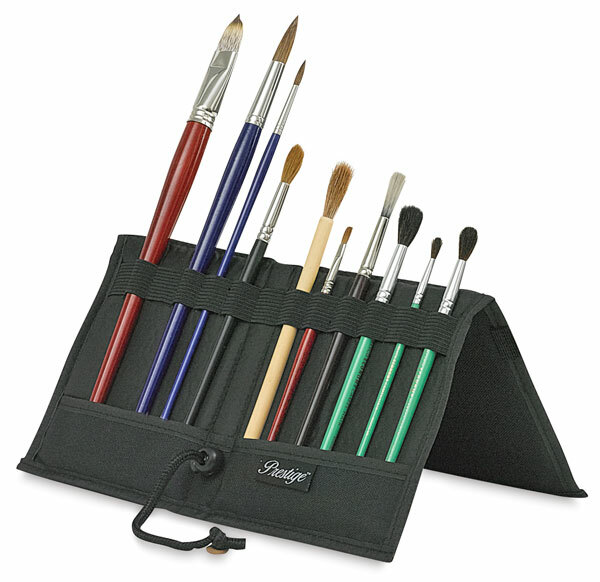 Made of durable black nylon with a hook and loop closure, this hard-cover brush holder protects small brushes and tools from damage. An adjustable drawstring cord secures the case so it stands upright, and a stitched elastic band holds brushes in place for easy access. The standard size holds brushes up to 13" (33 cm) long with handles up to 5/8" (1.5 cm) diameter and folds flat to a convenient 6" × 13-3/4" (15 cm × 35 cm) size. The large size holds brushes up to 15" (38 cm) long with handles up to 3/4" (2 cm) diameter and folds flat to a 7-1/4" × 16" (18.5 cm × 41 cm) size. Order Fulfillment Note — Your order will be fulfilled with either a Utrecht Paintbrush Holder or an Alvin Heritage Paintbrush Holder. Both brush holders are made from the same high-quality materials and have the same features.